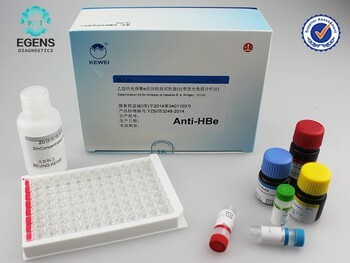 This HBeAb CLIA is a qualitative microplate chemiluminescence assay for the in vitro detection of antibody to Hepatitis B E Antibody (HBeAb) in human serum or plasma. It is intended to use in medical laboratories for diagnosis and management of patients related to infection with hepatitis B virus. 1. Prepare Reagents: Dilute 1 volume of Concentrated Washing Buffer (20×)with 19 volumes of distilled water, mix well. 2. Add Samples and Conjugate: Open the foil pouch and remove the Microplate. Set up 1 well as Blank, 2 wells as standard,1 well as negative control, 1 well as positive control. After dispensing 50μL of standard or Negative Control or Positive Control or Samples to the respective wells, add 50μl of Conjugate into each well except the blank. Gently vibrating the plate. 3. Incubate: Cover the Microplate with Plate Cover and incubate the Microplate in a thermostat-controlled water-bath or microplate incubator at 37℃ for 30 minutes. 4. Wash: Wash the Microplate for 5 times. Fill the wells with above 350μL of the diluted Washing Buffer, Soak for above 30 seconds, then aspirate again for each time. Make sure that the rest volume is minimal by tapping plate at absorbent paper. 5. Add Substrate: Add 50μL of Substrate Solution A and 50μL of Substrate Solution B to each well, Vibrate the Microplate. Cover and incubate the Microplate in the dark at room temperature (18-24℃) for 5-10 minutes. 6. Read the RLU value by a microplate chemiluminescence immunoassay analyzer. 2. For the assay to be valid, the mean RLU value of Positive Controls must be greater than the Cutoff value. 3. RLU value of the sample ³ cut off value, it is negative for HBeAb. RLU value of the sample < cut off value, it is positive for HBeAb. 1. Allow all kit components to reach room temperature before use. 2. Follow the direction insert to control the reaction temperature and time strictly. 3. Do not mix components of different lot numbers to use. 4. The kit should be store at 2-8℃. Do not use kit components beyond their expiration date.